i agree that the pucks should have had more effect in the front than what you report. did you remove the rubber bushing before installing the puck? same in rear(i did not)? front suspension drop when you lift the chassis? '89 kick w/little motor, still got pieces of jeff's pucks, stan's sticks into 4.24:1 tcase, 31x10.5x15's, rear lockrite, kick power steering, some radios(kj6esv), bmw seat, other changes just because. done on the cheap. suzi the psychic gets me fishing. The current situation is that its higher from the back However, The good thing about that is that when I load the back with heavy stuff the car almost evens out. On the other hand if i had it evened out with no load it will have to be lower from the back when loaded which might cause some rubbing issue but i am not quite sure about that. What i though of is replacing the 1.25" in the front with 1.75" but i am not very confident doing that as it might affect the wheels alignment & CV and the drivel ability. I am a bit confused here, I have installed 1.25" coil spacers all around front and rear along with 31x10.5 R15 tires. I want to even out all the wheels/fender spacing as it's currently much lower in the front. Will flipping the strut mounts increase the height by any means? Or shall I install bigger coil spacers in the front, I am a bit worried that this might affect the drivability ? Or shall I add strut spacers, I am not sure if that will help. There must be some other issue. With 1,25" spacers all around, it should be lower in the back if anything. I have used these in the past with great results. Inexpensive too. it does sound like you got it. i've heard of that rubber in a strut mount failing, but have not seen it. yet. And Chrome Don't Get Ya Home. Please just read and confirm for me. Ive done the springs while it was all out i removed the strut. I took the top nut off removed the funny shaped washer and slid off the Cap. pressed the bolts out, flipped the cap over, put the funny shaped washer back on the same way it came off did up the main nut. 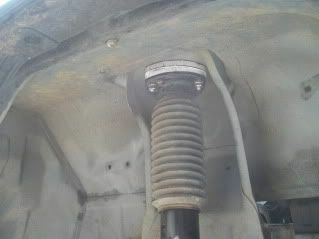 Now also when i reinstalled, between the Lip and the tower where bolts go thru i also packed with a couple of washers. jeeeez those are a great idea!, they dont sell stuff like that over here! i haven't worried about it- i've been running that way(flipped) for several years. i was a bit concerned, when i first did it, that it would affect the camber, but it aligns ok.
sorry- i ment caster, not camber(i used camber bolts).